This is the stairwell in the centre of the main level. 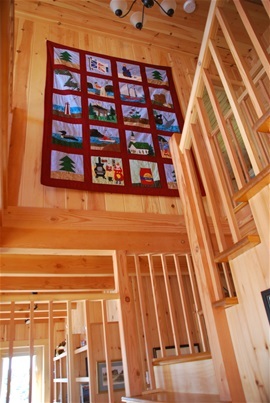 The quilt was handmade by a local artisan. Each square depicts a part of the Newfoudlander way of life and traditions. The INTERIOR is open-concept style on the main floor, with a very large full bathrooom. Three bedrooms, a full bathroom and an ensuite are located on the second floor. Top quality soundproofing material is between the two levels. All natural wood walls and higher ceilings with wooden beams throughout. Main level is 'wired for sound' with Boston Acoustics speakers, and also has a home theatre system, and free secure WiFi and local telephone service.